Happy Tuesday lovers! One step closer to vacation, woohoo! I'm definitely over this cloudy, rainy weather we've been having lately, it's making me want to live in jeans and tee shirts. Luckily there are so many cute tee shirts out there it makes it easy to rock this look, at least on the weekends. Even though I love a good casual t-shirt sometimes it's nice to glam it up a bit which is why I love this Happiness Boutique Art Deco statement necklace. There's something about wearing a t-shirt, destroyed denim shorts and Converse then topping off the look with a gorgeous necklace and some lipstick that makes me feel put together and classy but still feel comfortable and ready for anything. Even sprinting through the rain, which is exactly what I had to do during these pictures! Happiness Boutique has the cutest vintage inspired clothing and gorgeous statement pieces. I'm one of those strange people who hates paying a lot for shipping on something (especially jewelry) so I love that Happiness Boutique offers free shipping and a rewards program for their shoppers! Im a huge fan of the open shoulder or cold shoulder look. Just a fun new detail that makes a regular shirt a lil more fun. This one looks great with those shorts and necklaces, super fun, lady! I hate paying for shipping, especially when so many people offer it for free! Cute outfit,mine cutout shoulders are so unique. Such a cute top and I love the bold lip with it! Love this statement necklace! Also, you white Converse make me kind of sad with how clean they are lol. I was just looking at mine yesterday thinking "they're not that bad" but now looking at your's I've changed my mind! You look fab as usual darling!! Loving this outfit, babe- the statement necklace gives it just a bit of oomph! That tee is seriously too cute! 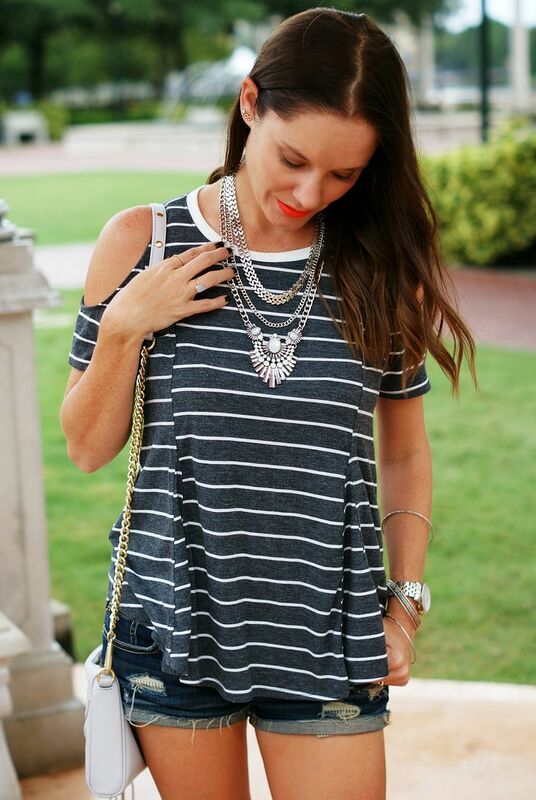 I love the open shoulders with the stripes and it's perfect with that necklace! Love the new converses too! Ohhhhh I love the length of that necklace! It would seriously go with everything! Those converse look so dang comfy. T minus 2 days!!! Love the open shoulder top!! Such a cute look for summer! Free shipping gets me every time! I love a tee shirt paired with a dressy necklace! I love that shirt! It's so different. The open shoulder concept is so cute. And I love it paired with the sneakers. That shirt is so great, it looks so fantastic on you.I'm so in love with that necklace. Love the converse. How do you keep them so white? I can never keep white sneakers white. Free shipping is seriously key for me when it comes to ordering online - I DESPISE paying for it!! Love the necklace you chose, so cute and will go with everything! Wow, that top is gorgeous on you!!! I like the open shoulders too - dressier than a regular old T-shirt, but just as comfy! 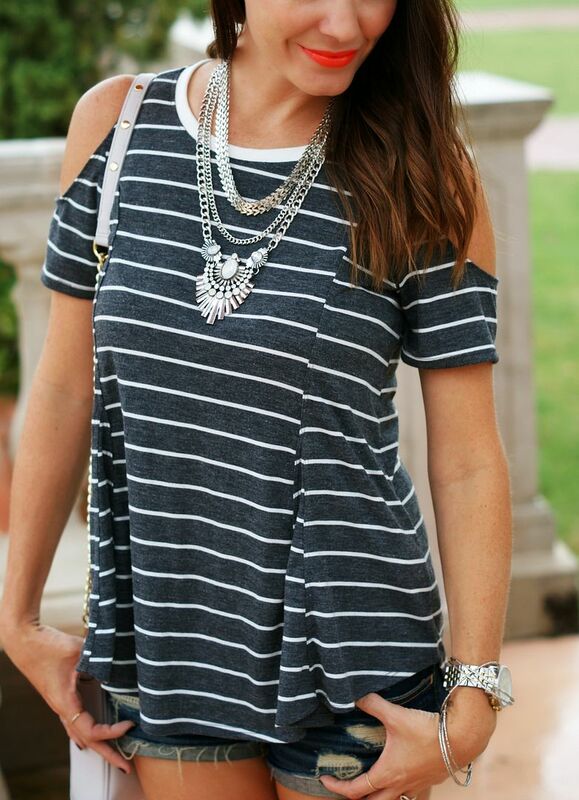 This top is adorable on you, I love the stripes and open shoulders! such a cute top! i love anything with stripes :) sorry about the gross weather you all have been having, we've actually been having nice weather, it's so weird! So cute!! It looks super comfy and I love it paired with the Chucks! I hope your weather turns around soon! I love love love your necklace! Love how you topped of this casual look with that necklace! That top is so cute!!! I love how you paired it with fancier jewelry to dress it up! Oh girl I like REFUSE to pay shipping haha so I think I'm stranger! I buy from Nordstrom, Target (free shipping with my REDcard), and if I buy from Old Navy I always hit the $50 free shipping minimum haha. Love the tee and the necklace! I love how nicely this top flows off the shoulder - it looks like it would be so perfect for staying cool with the flowy-ness! I love the open shoulder look. I recently bought one a little more that I've been waiting to wear out and about one weekend! Hoping Charleston brings nice weather for you ladies! Love this top… and the necklace… and that lipstick! You look fab! Love that shirt!! You totally rocked it! That last picture is SOOOO adorable! Totally loving this top. I really need to get something with the open shoulder detail! Love the stripes and open shoulders on your shirt. Paired with that necklace and the lip color it's perfect! !